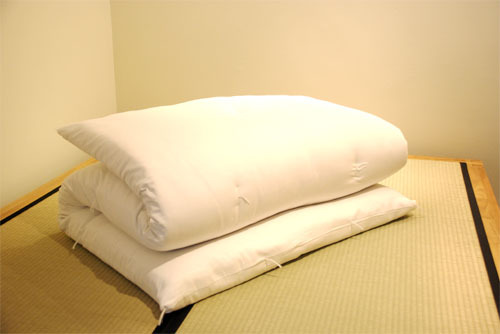 The shikibuton is placed on top of the foam mat so that the body sleeps directly on a natural, cooler surface rather than a synthetic one. Choose either 2 or 3 layers of cotton batting depending upon the degree of softness you prefer. The cotton is covered in a lightweight, soft, 100% cotton fabric. Then it is quilted by hand to ensure that the batting stays smooth and flat. Customers can also choose to cover their shikibuton with a removeable outer cover selected from a vast collection of beautiful & practical fabrics. 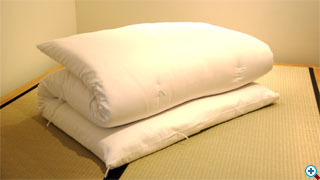 Single size shikibuton, uncovered and folded for storage. 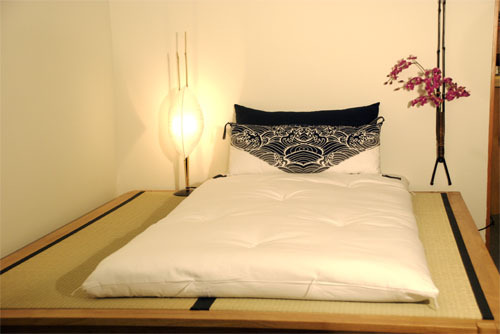 Unfolded shikibuton on tatami platform with tenugui pillow.